Our lawyers handle negligence and malpractice claims against Maryland hospitals. We trust these facilities to provide adequate care when we go to the emergency room, undergoing surgery, or recovering from an illness. Miller & Zois fights to bring justice for medical malpractice victims and families. Too often mistakes are made that causes severe injury or death. Our law firm has recovered millions of dollars in medical malpractice lawsuits against hospitals in the Baltimore - Washington area. If you have been a victim of medical malpractice or have lost a loved one, you can get a no obligation online consultation with one of our attorneys who will respond immediately. Patient care cannot be expected to be perfect. There is no question that there can be a bumpy ride at even the best of hospitals. But there are minimal standards of care that every hospital must meet. If they breach that obligation, and someone is hurt or killed, they have a duty to compensate the victims. Hospitals are required to meet these standards of care and adhere to certain policies and procedures to ensure the health and well-being of their patients. Hospitals have to make sure that the doctors who practice under their umbrella are licensed and otherwise qualified to do so. How often does this happen in a hospital setting? Far too often. The was a Harvard study conducted of medical negligence that looked at hospital records of over 30,000 patients. The study found that 1 out of ever 100 patients admitted to a hospital had a potential medical malpractice claim. Remember, most of these cases are presenting pretty simple medical issues. Can you imagine what the data would show if you weeded out those cases? Sure, some of the patients suffered only minor injuries, but a stunning 14% of the time the malpractice resulted in death, and 10% of the time the incident led to hospitalization for more than six months. Seven of those ten people suffered a permanent disability. The take-home message: medical malpractice happens way too often in Maryland hospitals. From a practical standpoint, it is worth noting that a medical malpractice fight is easier against a hospital or a non-doctor health care provider (such as nurses, technicians, etc.) than against a doctor. Why? Because juries in Maryland believe that non-doctor health care providers are more likely to make an error and cause a severe injury than doctors. Moreover, it is easier for a jury to blame the hospital than an individual doctor. Why? Because juries - for better and for worse - often see doctors as infallible. This is less of a problem when suing a medical institution. Hospitals also realize that their brand is not advanced when the Baltimore Sun reports that their hospital has been hit with a $10 million malpractice verdict. Insurance companies worry little about their doctors' reputation as the result of a malpractice verdict. But risk managers at hospitals always keep this in mind. One final consideration: doctors are sometimes reluctant to settle because their individual malpractice rates will rise. Doctors do not necessarily have veto power to decide whether a case settles. But many malpractice carriers, including doctor-owned Medical Mutual, which has most of the market share in Maryland, give their doctors a lot of latitude in deciding whether to make a settlement offer. At Miller & Zois, we understand how to find out what happened - what really happened not just what it says in the medical records. Our lawyers challenge hospitals to explain why the hospital did what they did. We identify violations of the hospital's policy and regulations (or what should have been the hospital's policy or procedure). Our lawyers also inquire about the hospital's duty to review the qualifications of their doctors to ensure that only qualified physicians practice within the hospital's walls (negligent credentialing). In Maryland, we are blessed to have two hospitals that are among the best in the entire world right in Baltimore: Johns Hopkins and the University Hospital (University of Maryland). But even at these great hospitals mistakes are made. Sometimes, good hospitals have bad doctors and sometimes good doctor make bad mistakes. If we make mistakes, we should be held accountable for those mistakes, even if they hurt someone else. In that respect, hospitals are just like all of us. Below is a list of examples of jury verdicts in Maryland having to deal with hospital mistakes. It is sometimes illustrative in trying to determine both the trial and the out-of-court settlement value of any civil case, to see similar cases and review their outcomes. There are limitations to doing this that are important to consider. A trial has so many variables. It 's hard to know from these summaries, what turned the verdict. Our law firm settled nearly $10 million against hospital defendants in 2015 and earned well over $10 million in verdicts and settlements in 2016. Regrettably, the terms of the settlement agreements arguably prevent us from disclosing the details of the claims for many of these cases that settled out-of-court. 2017: Baltimore County, Maryland $500,000 Verdict: The plaintiff was hospitalized at defendant St. Joseph Medical Center following surgery to treat his cancer. During that extended hospitalization he develops Stage IV pressure sores that developed necrosis and required part of his buttocks tissue to be removed. He sued the hospital alleging that the staff neglected to adequately monitor his skin and failed to follow guidelines to regularly repositioning him to avoid bed sores. Hospital denied wrongdoing insisting that his pressure sores were caused by his underlying health problems. The jury awarded $500k in damages. 2016, Maryland, Baltimore City: 10 Million Verdict. This Miller & Zois wrongful death lawsuit against the University of Maryland Medical Center ended in a $10 million verdict. A Baltimore pastor was given a dangerous drug without an explanation as to the risks associated with that drug. The drug (Kayexalate) destroyed the man's colon, causing his death. UMMS made no settlement offer in the case. The hospital appealed and lost. 2015, Maryland, Baltimore City: $3.8 Million Settlement. This Miller & Zois settlement against a Baltimore hospital is subject to a confidentiality agreement. 2015, West Virginia (Germantown Resident): $3.25 Million Settlement. This Miller & Zois settlement against a West Virginia hospital on behalf of a Maryland plaintiff is also, regrettably, subject to a confidentiality agreement. 2015, Anne Arundel County: $2,523,869 Verdict: A 19-year-old woman arrives at Anne Arundel Medical Center with severe back pain and numbness in her pelvis. She has three bulging discs and complains of more pain after running through an airport the week prior. A nurse notes the condition but does not perform any further testing. Doctors finally discover a ruptured disc two days later, which they then determine stemmed from cauda equina syndrome. By the time that they realize the actual cause of the woman’s pain, she has suffered nerve damage. She sues the hospital, claiming that they were negligent by not administering the proper tests. A jury agrees, awarding the woman $2,2523,869. 2014, Maryland, Baltimore City: $1,700,000 Verdict: A pregnant woman complains of shortness of breath when she arrives at the University of Maryland Midtown Hospital. She is transferred to the University of Maryland Medical Center, where an X-Ray reveals what doctors think is pneumonia or a pulmonary embolism. Doctors induce labor the following day without suggesting a C-Section. During delivery, the child’s arm becomes lodged, leading the child to be diagnosed with Erb’s Palsy upon birth. The child’s mother sues the hospital, claiming that the doctors were negligent by not utilizing alternate means to deliver the child; namely a C-Section. The case goes before a Baltimore City jury, which awards the plaintiffs $1,700,000. June 2013, Maryland: $620,000 Verdict: An employee of Baltimore City, 41, arrives at the University of Maryland Medical Center (UMMS) emergency room complaining of severe headaches. Upon arrival, the treating physician orders a spinal tap, which would evaluate any possible bleeding or injuries to the brain. After the spinal tap, the woman is released with no diagnosis and two pain pills. While at home, the woman is climbing the stairs and suddenly begins to experience excruciating neck pain. She immediately returns for treatment. This time, she is diagnosed with cervical disc herniations. The damages result in the plaintiff receiving surgery a year later. The plaintiff files suit against UMMC, alleging that the disc herniations occurred when undue pressure was applied to her neck during the initial spinal tap, violating the standard of care. The Defendant does not argue that according to the standard of care the pressure should not be applied during a spinal tap but do deny that such pressure was applied during the Plaintiff’s spinal tap. They argue the Plaintiff was not complaining of any pain following the procedure. The jury found the hospital liable for the city worker’s injuries and awarded her $620,000. March 2013. Maryland: $750,000 Settlement: A 56-year-old man arrives at an emergency care facility complaining of chest pains. An EKG test shows abnormal ST depressions and the man is instructed by the treating physician to report to the emergency room for emergency cardiac evaluation. The man reports to the hospital where he presents a copy of the EKG and a report of his initial complaints. The emergency room physician orders two additional EKGs. The doctor dismisses the man, informing him that the additional EKG results show a normal sinus rhythm with a septal-myocardial infarct. Three days after being released from the emergency room, the man suffers a fatal myocardial, leaving behind four children. The man’s estate brings suit to the hospital for medical malpractice, alleging the negligence of the emergency physician caused the man’s death. The Plaintiff claims the standard of care required the doctor to not only admit the patient for observation and evaluation but also to seek a cardiology consult. The parties agree to settle for $750,000 before trial. January 2013, Maryland: $3,000,000 Settlement: A 21-year-old woman is pregnant at 27 weeks and is in severe distress. She arrives at an outpatient labor center of the defendant hospital. After multiple tests, she is diagnosed with pre-eclampsia. The woman is stabilized and taken to surgery where she is given an emergency C-section. The child is born in distress and requires resuscitation. She is transferred to a specialty hospital where she is treated for hemorrhagic and ischemic changes in the brain. Thankfully, the child is stabilized and transferred to a third facility for long-term treatment. The infant suffers from irreversible brain damage. She will never be able to walk, talk or take care of herself and will remain ventilator-dependent. Plaintiffs sue the hospital for medical malpractice, claiming the blood studies obtained at the time of birth showed the infant had not suffered significant brain injuries, yet blood work obtained 41 minutes after the birth showed severe acidosis. They allege the hospital failed to provide the child with timely treatment, thus violating the standards of care. The parties agree to resolve the claim and settle for $3,000,000. July 2012, Maryland: $21,000,000 Verdict: A woman at 31 weeks pregnant arrives at MedStar Harbor Hospital in Baltimore with symptoms of high blood pressure. While in treatment, she is evaluated by a maternal-fetal medicine specialist and connected to an electrical fetal heart rate monitor. The specialist instructs that should the mother and fetus remain stable, a vaginal examination delivery was possible, but should the status worsen, delivery must be via Cesarean section. The woman is kept overnight and is induced for labor the following morning. A few hours after they induce her, an obstetrician and gynecologist conduct a vaginal examination and note her cervix is four centimeters dilated. At that time, the fetal heart rate is reassuring with minimal variability. A few hours pass and the heart rate drops. The physicians decide to perform a C-section. But, inexplicably, they wait 5 hours. Upon delivery, the infant’s neck is wrapped in his umbilical cord, and he appears pale and lifeless. While the child is fortunate enough to survive, he is ultimately diagnosed with cerebral palsy. Plaintiff’s experts indicate that while the heart monitoring strips were originally assuring, the later strips showed severe fetal distress. They claim these tests should have called for the obstetrician to demand an emergency C-section as opposed to allowing the labor to continue unnecessarily for three additional hours. Plaintiff’s expert in neonatology testifies the cord was strangling the baby, creating a lack of oxygen to the brain. The cord had to be surgically removed and had the physicians complied with the standards of care, there would be a 95-percent chance the child would have been born a healthy baby boy with little to no injuries. Defendants’experts claimed brains that are deprived of oxygen give off an acid that shows in blood, which the child did not. They also stated that had the child suffered brain damage from asphyxia at birth, ultrasounds would have indicated brain swells. The jury found the Medstar Harbor Hospital and the treating physicians liable and awarded $21,000,000. April 2011, Maryland: $1,038,312 Verdict: An elderly woman who has a history of aortic stenosis arrives at Johns Hopkins Hospital for aortic valve surgery. During the operation, the doctors find that her aortic root was small and low on the aorta. They replace the valve with a preserved pig tissue and patched it with cow tissue. The surgery is completed, and the woman is discharged. Shortly after that, the opening to the coronary arteries blocks and the woman suffers from heart failure. Consequently, her heart is re-arrested, and the aortic root has to be replaced. As if these complications were not difficult enough for the woman to handle, her liver and kidney begin to fail, and she is placed on a ventilator. Her condition worsens. She undergoes a tracheotomy and has a feeding tube inserted. 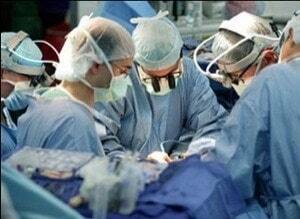 After the multiple procedures and complications, the woman, unfortunately, passes at the age of 67. The woman’s estate brings a wrongful death suit against the Johns Hopkins for failing to follow the standard of care during her procedure. They allege the medical team failed to perform an aortic root replacement during the initial procedure. The jury finds in favor of the Plaintiff and awards a verdict of $1,038,312 (the amount was later reduced to $912,998). Make no mistake about it: these cases are complicated and expensive. Hospitals just don't admit their mistakes.... unless they're forced to so in court or at the settlement table. But our lawyers have taken on this challenge many times and won. Do you need our help? If you have been injured as the result of medical or hospital malpractice or negligence, call us at 800-553-8082 or click here for a free consultation.